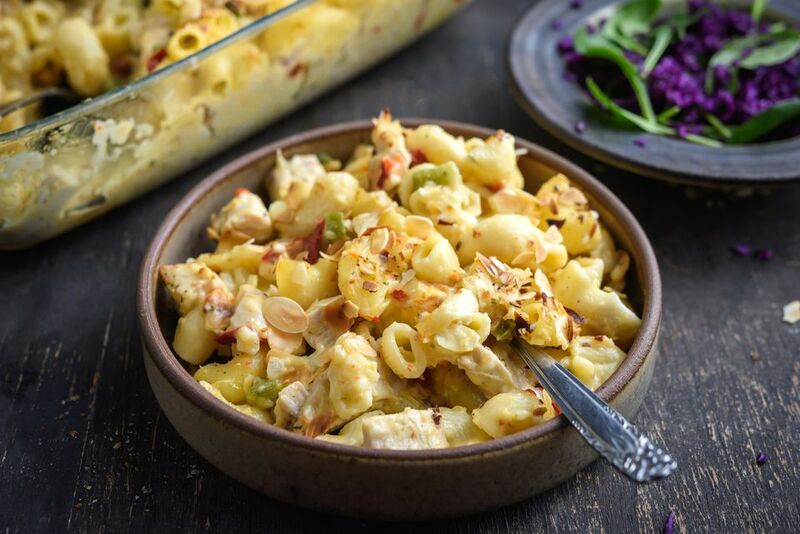 This easy turkey and macaroni casserole is an easy and tasty combination of ingredients. The sauce is made with cream of chicken soup and cheddar cheese. It's topped off with sliced or slivered toasted almonds for extra texture. Cook and drain macaroni following package directions. To toast nuts, spread out in a single layer on a baking sheet. Bake in a 350 F oven, stirring occasionally, for 10 to 15 minutes. Or, toast in an ungreased skillet over medium heat, stirring, until golden brown and aromatic. Preheat the oven to 350 F and butter a 3-quart casserole. In a medium saucepan, melt butter over medium-low heat. Add celery, green pepper, and onion; cook until tender. Blend in soup, milk, and shredded cheese. Cook, stirring, until cheese is melted. Combine the cheese mixture with the cooked and drained macaroni, pimiento, turkey, salt, and nutmeg. Transfer to the prepared casserole; top with toasted almonds if using. Bake in the preheated oven for 30 minutes, until hot and bubbly. Serve with a side salad, if desired.